Iz is an authentic Indian restaurant that operates within Grand Hyatt Hotel in Oud Metha, Dubai. This wonderful restaurant has been able to make its mark with the exquisite taste and flavours of its food. Due to this reason, delectable dishes of this restaurant are considered exclusive and to savour them chic and elite crowd of Dubai often visits this place, thanks to the elite team of chefs at Iz. Interior decor is another reason, which allures several customers to this restaurant, as it is well lit, furbished with cream and pale wood colour furniture accompanied by large raised tables, which are set in a semi-circle to maintain the privacy of the guests without giving the feel of isolation. It is because of these fine features that Iz Restaurant is rated so high among the Indian restaurants in Dubai. 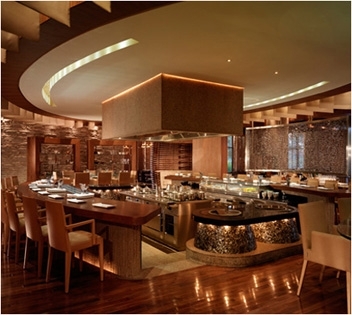 Modern Indian and rich Emirati families are the regular customers of this bistro that serves authentic Indian food and vegetables dishes in posh settings of Grand Hyatt Dubai. Top Indian delicacies like prawn masala, meats and vegetables baked in the hot oven (tandoor) are the specialties of the place. Diners can also opt for fresh fish, poultry, rich flavoured curries, dal and biryanis at this restaurant, where all these dishes are prepared with fresh ingredients on live cooking stations by master chefs. Fine range of alcohol is another pick from the menu, which most guests like to savour with food. Guests can also bask in business lunch at this site plus the excellent views of the city including Creekside from its open area seating. Moreover, smokers are permitted to smoke in this restaurant. Iz at Grand Hyatt Dubai opens daily and serves lunch from 12:30 pm to 3:00 pm on all seven days of the week, whereas dinner is dished up between 7:00 pm and 11:30 pm from Saturday to Wednesday, but on Thursday and Friday it is handed out between 7:00 pm and midnight. Grand Hyatt Dubai Hotel, Sheikh Rashid Rd - Dubai - United Arab Emirates. Dubai Healthcare City Metro Station 1 is 950 metres away from Iz Restaurant at Gran Hyatt Hotel in Oud Metha. To cover this distance on foot, you will require about 11 minutes's walk. Head east on 26th Street towards 13th Street, from this metro station and then at the roundabout, take the second exit onto 9th Street, before making a left turn, then a right turn and afterwards a left turn. This will guide you to another turn on the right side from where you need to make a left turn and later turn left again in order to get to the destination that is located on the left side. Iz Restaurant is 800 metres away from the nearest bus stop called Dubai Healthcare City Metro station A1 – Dubai. This distance can be covered on foot in about 10 minutes time frame, if a person heads east on 26th Street from this bus stop and then at the roundabout, take the second exit onto 9th Street to make a left turn afterwards. Later that person should turn right, before making a left turn, from where he or she should turn right, and then make two left turns to finally reach the destination on the left side. Visitors can use any of these bus numbers 22, 42 and C7 to arrive at this bus stop. See map for directions.